I have been hard at work with my team to help launch the Juicy Ideas Competition website. I am happy to say that it has been successfully launched as of last week and we are receiving signups for the competition. My company, DigitalChalk, is sponsoring a competition with AdvantageWest and will be sending the winning team to Google Headquarters in Mountain View, California. The winning team will also receive 5 Android phones provided by Google. The competition is a software competition that challenges college students to do something innovative and creative using data that will benefit their community. I know that we will see some very cool applications come out of this competition this year! 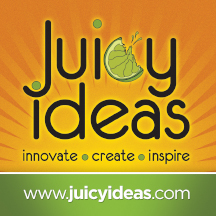 If you would like to compete, or know someone that should, send them to the Juicy Ideas website at: http://juicyideas.com and have them register their team. The video on the homepage was done by DigitalChalk's very own Jacob Absire and I love it. You can check it out on YouTube as well. Cool video! Hope you get some great ideas! Excellent video! Look forward to seeing the great ideas from this competition. I'll facebook about it to get the word out.